A: U.S. Representative John Dingell, from Michigan, is the longest-serving member of Congress in U.S. history. The lawmaker retired from the U.S. House of Representatives in 2015 at the age of 87 after serving since 1955. 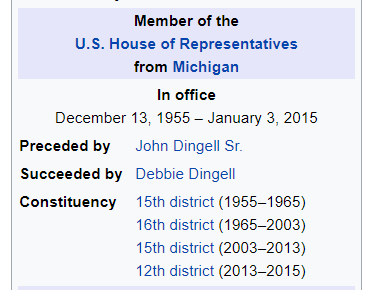 Dingell holds the record for longest serving member of Congress at 59 years, 21 days. That’s 30 terms in office. Elected to Michigan’s 12th congressional district via a special election, Dingell assumed the seat vacated by his father who died while in office after serving for 22 years. Due to redistricting, he held congressional districts 12, 15 and 16. 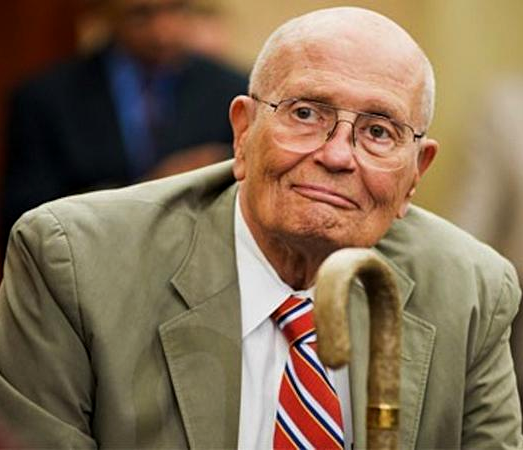 John Dingell, Jr. served under seven presidents from Dwight D. Eisenhower to Barrack Obama. The office is currently held by his wife, Debbie Dingell who succeeded him. This means that the southeastern Michigan area has been represented by a Dingell since 1933 (85 years).